What are the career prospects for young scientists in today’s globally connected world and what is the role of the early career researcher in innovation? 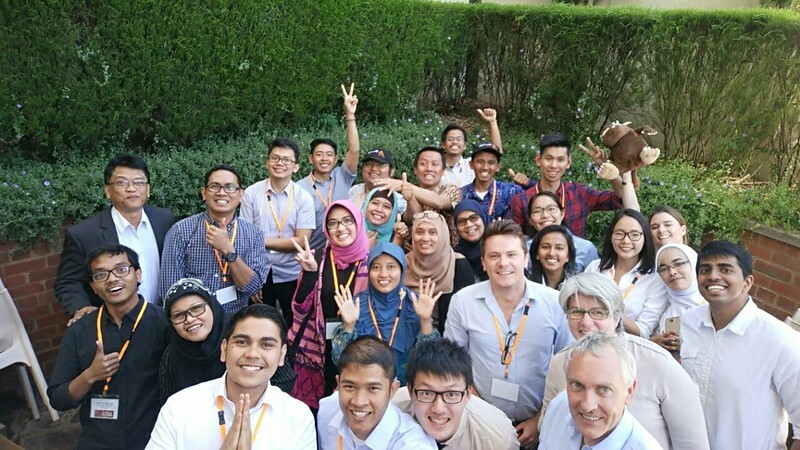 The Australia Indonesia Science Symposium will tackle these and other questions on Thursday 1 December at the Shine Dome in Canberra and joining them in the debate will be the Australia-Indonesia Centre’s newly formed Graduate Research Interdisciplinary Network (GRIN). The GRIN group of twenty-two graduate researchers and four senior academics, from four Australian and seven Indonesian universities, were welcomed to Melbourne by the Indonesian Consul General, H.E. Ibu Dewi Savitri Wahab and explored big data and visualisation at Monash University on the first day of the program before embarking on a ‘Research Roadtrip’ through Victoria to Canberra. The program in Canberra included a workshop by A/Professor Inger Mewburn, the Australian National University’s ‘Thesis Whisperer”, on how to be a superhero in a science career which covered the skills and approaches needed to work in an academic environment. The GRIN group also toured Canberra’s Innovation Network and visited the Department of Foreign Affairs and Trade’s Innovation Exchange for a session hosted by Mr Jeff Roach, to learn how local and national governments are addressing innovation through start-up support as well as internally through innovative approaches in policy development. A workshop on design thinking by A/Professor Henry Linger from Monash University stretched the GRIN Project teams to look at their concept from the perspective of a person who would be directly involved or impacted by the idea. Coming together for a dinner with the Academies of Science for an evening hosted by Professor Peter Kanowski, Master of University House and winner of the Australian National University’s Prize for best supervisor in 2015, the GRINnovators had an opportunity to debate whether the role of the supervisor in today’s connected society was obsolete. Arguing for the affirmative, Professor Kanowski and A/Professor Ulfah Siregar from IPB Bogor, were soundly beaten by Ms Ernauli Aprilia (Lia) from Sydney University and I Made Wahyu from ITS Surabaya, who convinced the diners that supervisors were still relevant and important to them as PhD candidates. In opening the dinner Mr Kieran Sullivan from the University of Melbourne and Mr Bintang Yuwono from Institut Teknologi Bandung made the case that the future of innovation is in good hands in both Australia and Indonesia. Quoting Einstein, Kieran reminded us that we ‘Cannot solve our problems with the same thinking we used when we created them’. The evening closed with the Presidents of the Academies, Professor Sangkot Mazuki and Professor Andrew Holmes providing reassuring advice to the graduate and early career researchers that they will always be young while they remain engaged in the pursuit of new knowledge. Manager of the GRIN Program Katrina Reid can be contacted at the Australia-Indonesia Centre at katrina.reid@monash.edu.